Hack Tutors is one of the leading marketing blogs on the web. We reach a large, influential audience of customers unseen by other websites or blogs. Our audiences are interested to learn how to make money online, search engine optimization techniques, marketing in social media and promoting their business websites and blogs. Advertising with Hack Tutors lets you find your potential high-end customers who are interested in the services or products offered by the advertiser. We receive over 200,000 impressions every month with targeted 150,000 unique visitors. 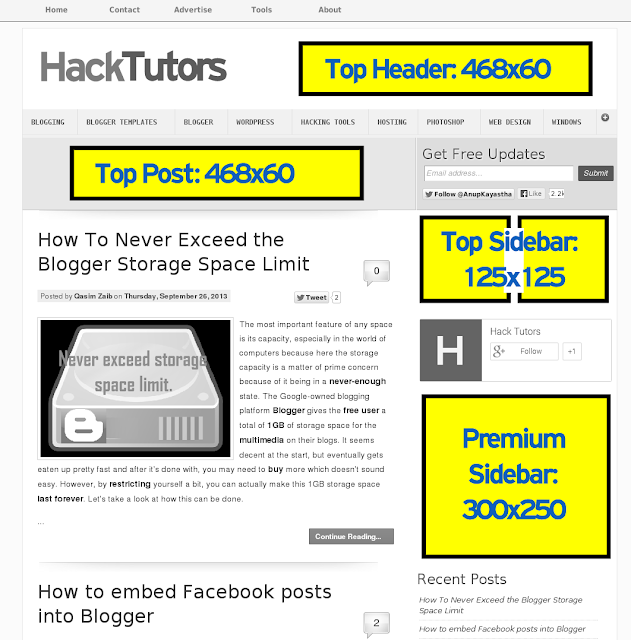 Hack Tutors is a authority blog with Google page rank 4, currently Alexa Rank below 90K. There are several advertising options on HackTutors. For traditional display advertising, we offer standard sized units through the self-serving widget below or you can directly purchase through BuySellAds. Our past advertisers includes, Zoho, Fiverr, A2Hosting, HostGator, DepositPhotos, and many other search engine optimization and social marketing companies. We had such a pleasure doing business with them. We heartily thank them for staying with us for months to promote their business. Want a custom ad placement or sponsorship? Contact us for any particular advertising request.